Tens of thousands of local and international visitors took part in the closing ceremony of Hue Festival 2018 at Ngo Mon (Noon Gate) Square in Hue City on April 2. The grand closing ceremony with firework shows was a rendezvous of different cultures with more than 400 artists of domestic art troupes taking part, including Hue Drama Theater, Viet ac Traditional Theater, Bong Sen Traditional Music and Dance Theater, Quang Binh Traditional Art Theater and foreign groups of Mongolia, Thailand, the Philippines. The 6-day festival attracted 1.2 million visitors, received up to 50,000 tourists per day. The ancient capital's biggest int’l event under theme of “Cultural heritage with integration and development, Hue - one destination five heritage properties" included a series of cultural activities with the participation of nearly 1,300 artists of 39 local and international art troupes, including 15 domestic groups and 24 foreign troupes of 19 countries and territories. 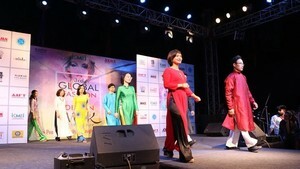 Highlights of the activities, such as Royal banquet, street festival, a concert marking musician Trinh Cong Son's death anniversary, Rural Market on Festive Day in Huong Thuy district, Ao Dai fashion show, “Am vong Song Huong” (Resonance of Perfume River),and a special art performance “Van hien kinh ky” presenting the building of the capital and implementation of the country's sovereignty, unity of whole nation drew a huge number of people. The 2018 Hue Festival was a venue for international arts exchanges between countries. 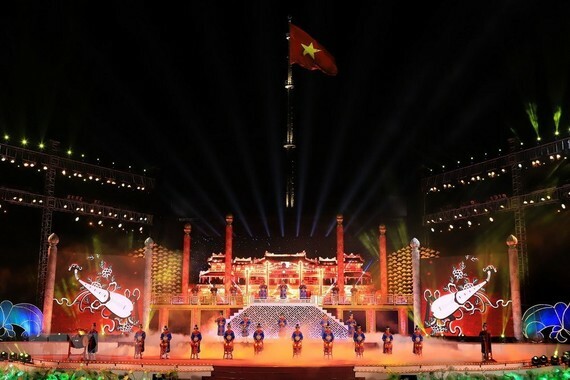 The biennial festival aims to promote Vietnamese and Hue culture and the tourism-socio-economic development of Thua Thien-Hue Province, said the organization board. The event was also a chance to introduce to international visitors the UNESCO heritages of the old capital of Vietnam, including Hue Complex of Monuments, Hue Royal Court Music, Woodblocks of Nguyen Dynasty, Nguyen Dynasty's royal documents and the royal literature on Hue royal architecture. The closing ceremony bid adieu to all international friends who had come from around the world to enjoy the biggest cultural festival in the country and are already eagerly anticipating Hue Festival 2020.
the 10th Hue Festival Hue - one destination five heritage properties Hue Complex of Monuments Hue Royal Court Music Woodblocks of Nguyen Dynasty Nguyen Dynasty's royal documents the royal literature on Hue royal architecture.